Before getting into the art of a moment of the history, we should mention some theoretical matters about art and history. Because any artistic expression needs to be understood in space and in time. So, the artwork is a cultural statement, as for instance the Manueline style of XV-XVI century in Portugal. 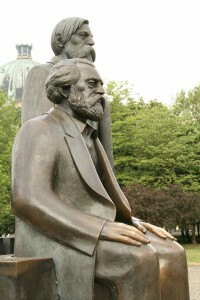 With the esthetic and the technique, the context (historical, geographical, economic, social, political, ideological…) determinates the nature of an artwork. Also a big part of the history of art included in the academic programs is composed by sacred artworks (churches, cathedrals, sacred images…), coming from historical periods with a strong spirituality and where the religion played a very important social and political role. As it happened in Ancient Egypt. Looking at Ancient Egypt there is a contrast between the royal tombs of the Old Kingdom, with their pyramidal superstructure, which made the pharaoh’s tomb so obvious, and the hidden tombs made during the New Kingdom in the Valley of the Kings. Or among the solar open air temples of the Old Kingdom and the sacred massive buildings dedicated to the ancient Egyptian deity Amon of the New Kingdom. 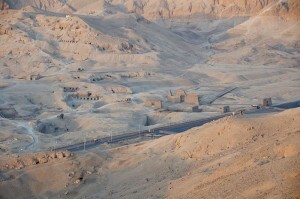 General view of the Valley of the Kings. Photo: commons-wikimedia. So, an artwork is a human production and it is conditioned not just by the author’s skills, but also by the moment and the place where it is produced. Ancient Egypt was not an exception. Very intersting as usual. Looking forward to reading the whole ‘Ancient Egyptian Art’ series. B.N. A very interesting comparison you drew up there, but have you ever considered the likelihood of The ‘Pyramids’ not being royal tombs? Thank you Dr. Ashraf and I am sorry for the delay in answering you. To be sincere I have never though of the Pyramids not being royal tombs. 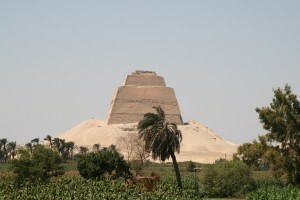 Huge sources were neededto be built, and I am convinced they were pharaonic tombs. What do you think?